About a hundred people turned out at Bennett Park today to express their love for and solidarity with the people of New Zealand in a vigil for those murdered by a racist madman there last Friday. Elected officials joined with religious figures to condemn racism, violence, and to encourage people to do the right thing, go high, and use the tools of Democracy to change the course our own country is on. A Moment of Silence for New Zealand’s loss. Council Member Mark Levine said that something struck him about the initial news reports that 49 were killed. Then he realized what it was: that was the same number of people killed in the Pulse Orlando spree. He also contrasted the empathetic response to the massacre by NZ Prime Minister Jacinda Ardern with the belated and equivocal tone taken by our president in response to Charlottesville. 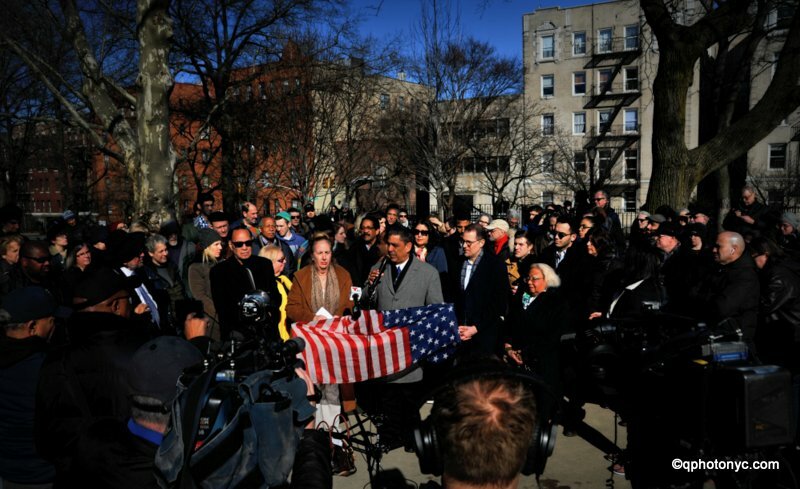 After relating this latest instance of hate inspired mass murder to anti-immigrant policies and Xenophobia generally, U.S. Rep. Adriano Espaillat noted the role of firearms in both these high profile incidents and in the far less publicized homicides of young men in our NYCHA projects. Rabbi Gale, in response to an inquiry from the Gazette, remarked that while similarities certainly exist between Germany’s climate in the 1930s and ours today he noted there’s also a major difference: we have the ability to learn from that history. They didn’t have that. Jackson, Gale, Algabyali, flyer, Espaillat, Levine, De La Rosa.